As I was talking a walk round garden, being careful not to step on any more daffodils, I took a couple of shots for future posts and this one – which seems nice enough – has something about it, which makes me stop and think. When I look at this picture, I see the obvious vivid yellow bud of the daffodil. It’s not closed, but is just beginning to open and I think that’s the crux of it. It’s the anticipation of the flower that this will open into. It’s what the opening bud will become. I know it will form a beautiful flower with a wonderful fragrance. At the moment though, it is just a bud, but it seems that if I watch the picture for long enough, I’ll see it slowly open into flower. 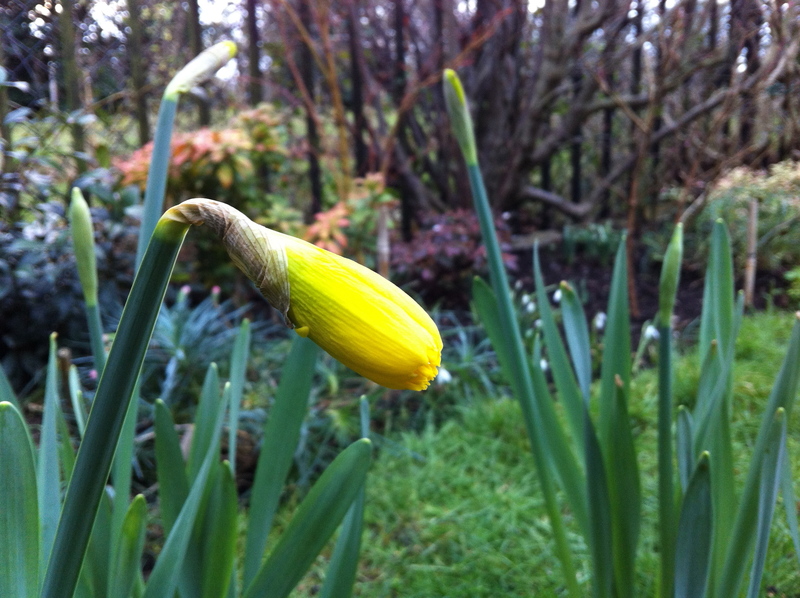 Although we have a few plants in flower at the moment, the daffodils are the first big vibrant blooms of the year and although it is barely February at the moment and still cold, they’re a sign that the garden is very gradually beginning to wake up.